A wood arbor or pergola is the perfect way to transform a boring garden into something magical and spectacular. They are perfect in backyards as well. Arbors are simple and charming, and because there are so many styles you will have a lot of fun picking one out for your home. But first, what exactly is an arbor, also referred to as a pergola? It’s simply an archway constructed of wood or other materials, although arbors were traditionally made up of leaves and branches. Today when you purchase an arbor, it usually includes elegant latticework that you can cover with vines and flowers. At the same time, you don’t have to have plants or vines covering an arbor or pergola. It is perfectly acceptable to leave it on its own to work as a focal point in your garden. Arbors also make beautiful entrance ways. Most people choose a wood arbor or pergola just because it is more beautiful. Also, wood matches many different styles and only adds to the natural beauty of your garden or backyard. You can find many different shapes and sizes as well. Red cedar is the most popular choice for pergolas because it’s very durable. It’s also rich in color, easy to work with if you’re building your own pergola, and resistant to moisture and insects – perfect for outdoor use. Pergolas are available in other types of wood as well. In the end, what you choose really depends on your personal circumstances. The most important thing to look for is the style of arch. Arches are either round, flat, pointed. A different arch results in a different look, so choose an arbor or pergola with an arch you think will go well in your garden. But arbors can also include other features, such as a bench or seat, a gate, planter boxes, side wings, or a central swing. Some arbors and pergolas come with a loveseat. 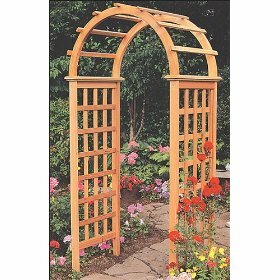 Although most pergolas provide little more than something nice to look at, this is the kind of arbor that actually has a function. You can sit under the arch and enjoy your beautiful garden. Wood arbors are great for accentuating certain parts of a backyard and making it look more beautiful. Sometimes they’re used as entrance gates to welcome guests. Arbors and pergolas can range between 3ft. and 7ft. tall. Select an arbor based on the purpose it will have in your backyard or garden. Some arbors are even adjustable. Other than wood, you can purchase arbors and pergolas constructed of copper, vinyl, and wrought iron.